Magnalight.com has announced today the addition of the EPL-QP-1X150-100 explosion proof halogen light tower to its extensive line of explosion proof lighting equipment. The portable tower and removable lamp assembly design of this tower provides versatile operating options, and a simple halogen lamp provides effective yet economical illumination. Providing 1,500 square feet of work area coverage with 1,520 lumens of light output, this affordable tower light provides reliable illumination and convenient portability in an easy to deploy lighting package. The EPL-QP-1X150-100 is designed to be very stable when the 150 watt explosion proof light is fully deployed to 12 feet. The Magnalight EPL-QP-1X150-100 quad-pod mounted explosion proof halogen light tower is designed to provide operators in hazardous locations with a powerful yet economical portable lighting solution. This halogen light tower provides 1,500 square feet of work area illumination and produces 1,520 lumens of light output. Equipped with a 150 watt halogen bulb that produces illumination in a wide flood pattern, the explosion proof lamp housing on this unit is suitable for wet areas and marine environments and tested to 500 hours of salt spray exposure in accordance with MIL-F-8115C military specifications. The lamp housing is a pedestal mount design constructed of powder coated cast aluminum, adjustable through 135° of vertical movement, and can be removed from the tower and used independently as a portable area light. The tower is constructed of non-sparking aluminum with four foldable legs that can be retracted and folded into place along the main tower mast for easy takedown and transport. 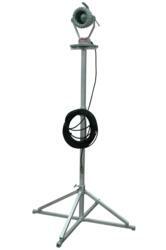 This unit can be extended from 5 feet to 12 feet in height to provide precise work area coverage and built for strength with a 2 inch square aluminum center support mast and legs constructed of 1.5 inch square aluminum tubing. This unit is designed to allow operators to simply remove the lamp assembly and utilize it as a standard pedestal light for areas where a tower is not desired or needed, allowing this unit to serve over a wide variety of work applications with equal effectiveness. 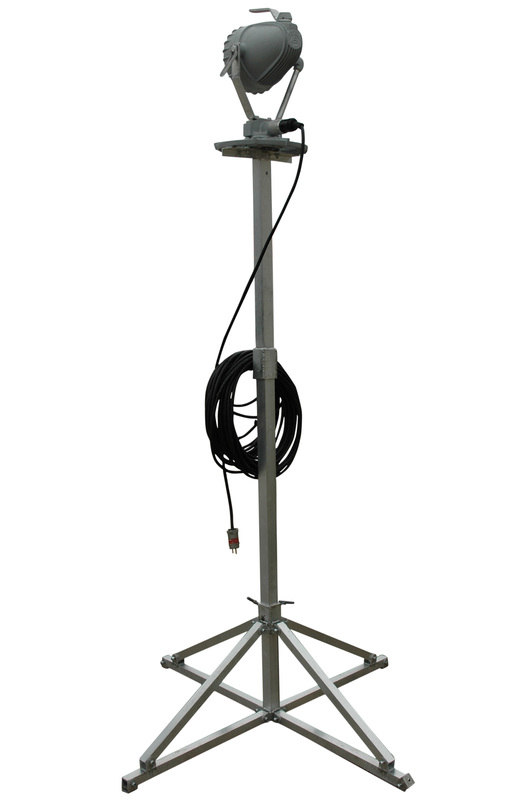 Included with this explosion light tower is 100 feet of 16/3 black SOOW cord fitted with an ECP 1523 5-15P explosion proof straight blade plug for secure connection to power sources and plenty of length for moving the unit about the work space as needed. This light tower operates on standard 120VAC power and is an ideal alternative to higher priced HID and LED towers for operators who desire the reliability of industrial grade design construction without the associated high costs. “The EPL-QP-1X150-100 is designed to be very stable when the 150 watt explosion proof light is fully deployed to 12 feet,” said Rob Bresnahan with Larson Electronics’ Magnalight.com. “This heavy duty aluminum quad-pod will collapse to less than 55 inches and only weighs 17 pounds without the light head. When operators fold up the legs, they will lock into place and the entire hazardous location lighting solution becomes very portable and very easy to ship via UPS small package. Many times, customers need these lights next day air. Traditionally, an industrial grade tripod mount light needs to go on a pallet, so next day air can be expensive and difficult to organize. But the EPL-QP-1x150-100 explosion proof mini light tower combines rugged durability with ease of shipping and portability via standard small package services." Larson Electronics’ Magnalight.com carries an extensive line of explosion proof lights, hazardous location lights, intrinsically safe lights, portable explosion proof light towers, and intrinsically safe LED flashlights. You can view Larson Electronics’ entire Magnalight line of explosion proof lighting at Magnalight.com. Magnalight can be reached directly by calling toll free, 1-800-369-6671 or 1-214-616-6180 for international inquiries. This halogen light tower provides 1,500 square feet of work area illumination and produces 1,520 lumens of light output.